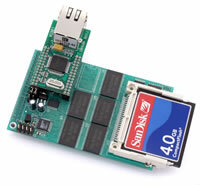 With dimensions of 3.6 x 2.3 inches, the MMC is a multipurpose expansion card designed to add up to 8M bytes of high speed SRAM, a CompactFlash card receptacle, a 100 M baseT Ethernet/IP module, and 4 channels of 16-bit high speed ADC inputs. Up to eight low power 16-bit SRAM chips can be installed. In the default configuration, 256KW chips are used to provide a total of 4 MB of memory. Optional 512KW chips can be used to make 8MB of memory available. The host controller can access all 8M bytes of SRAM via a 256-byte memory window. This high-speed SRAM memory could be used as a ring buffer for high speed images or ADC data storage, for example. Optional WizNet Ethernet module provides 10M/100M base-T network connectivity. 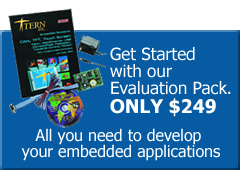 This module represents a huge leap forward in performance when compared to other raw MAC-only embedded Ethernet networking solutions commonly in use today. It releases internet connectivity and protocol processing from the host processor, which represents a huge improvement over software based TCP/IP stacks. The resulting system can easily handle transmissions in the 200KB/s+ range in real world applications, leaving the board free to manage other real-time behavior. Software libraries and demo project demonstrating TCP and UDP clients/hosts, HTTP web servers, and more are provided. The WizNet module has a hardware LSI TCP/IP stack implementing protocols like TCP/IP, UDP, ICMP and ARP. Four fully configurable independent sockets can be handled simultaneously. It has a 16KB internal transmit and receiving buffer accessed directly through the memory bus. A 16-bit parallel ADC (AD7655, 0-5V) supports 4 channels of high-speed (1 MHz conversion rate) analog signal acquisition. The AD7655 allows simultaneous sampling on two channels. With a precision external 2.5V reference, the ADC accepts 0-5V analog inputs at 16-bit resolution of 0-65,535.
transfer large amounts of data to or from a PC. The MMC can be driven by most TERN controllers via J1&J2 expansion headers.